The French ship, which went down with the loss of all hands on 18 March 1915, was probably hit by one of the ingenious floating mines from Canakkale. The rails along which they were propelled can be seen at the Naval Museum in Canakkale. 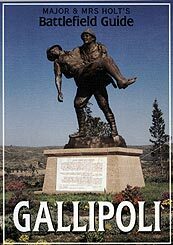 This is the book of the Gallipoli Peninsula. It charts in fascinating detail what happened at every recommended stop and brings alive, with cameos and anecdotes, the people who fought there: leaders, heroes, historic regiments, poets, 'Tommy', 'Digger' and 'Johnnie Turk'.